Humanity is the industry-leading, cloud-based employee scheduling software with time tracking and much more. Our brand promise is to improve, streamline and simplify your staff scheduling processes. Try our scheduling software and app free for 30 days. Humanity. More Than Just a Schedule Maker. 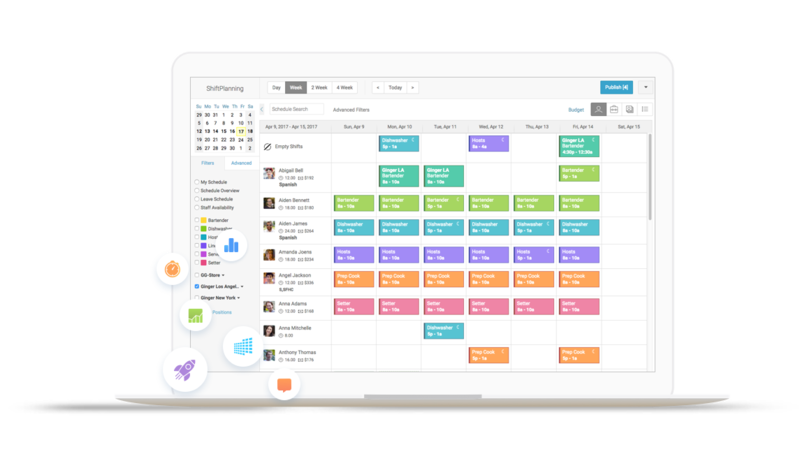 In addition to staff scheduling, Humanity offers features that include timeclock, vacation management, advanced reporting, messaging, and training. Speed up your employee scheduling process by up to 80 percent. Create error-free, dynamic employee schedules and inform staff of their upcoming shifts automatically. Build flexible work schedules and schedule employees in multiple locations, departments, positions, and skills with real-time conflict checking. Put an end to absenteeism, buddy clocking, and tardiness. Make it easy for staff to clock in and out of shifts and breaks. Ensure more accurate time-clock data through manager approvals, GPS tracking, as well as facial recognition and biometric stations. Never worry about being overstaffed or understaffed again. Manage staff availability, vacation and leave requests better by giving employees more independence in the process. Quickly find available workers to cover last-minute absences and fill open shifts with ease. Why use outside chat tools for communication when you don’t have to? Centralize all staff communication to increase productivity and keep your employees in the loop. Post company-wide announcements and chat with staff in real time from anywhere, anytime. Effortlessly transition new staff into your company. Create training programs, assignments, and tests to onboard staff and facilitate career development. Streamline and improve your processes and budgeting. Consolidate and transmit your time clock and labor cost data to your payroll provider easily. Effortlessly run comprehensive, custom reports for all your most vital staff-related KPIs. See what users have to say about Humanity’s employee scheduling capabilities. Why Use Humanity Employee Scheduling Software? See how Humanity will improve, streamline, and simplify your staff scheduling process. Humanity has powerful scheduling automation features that allow you to repeat shift schedules automatically. This saves you time by eliminating the need to create a new schedule from scratch every week or month. Work in cooperation with your staff to get a better feel for their shift preferences. Employees can set their own availability, allowing you to schedule your team more effectively according to what works best for them. Give your team a greater level of autonomy by letting them request shift trades on their own. Dramatically cut the time you need to spend on scheduling by making your team more proactive in the process. Follow and track trends in your employees’ work behavior. Always have a clear picture of who is trading shifts, missing shifts, or working overtime. There’s no need to scramble to find replacements for unfilled or missed shifts. Humanity displays all of your team members according to the position that you need to fill and lets you know who is available to cover. Humanity’s intuitive and easy-to-use employee scheduling algorithm significantly cuts down the time it takes you to plan your team’s working hours. Spend less time scheduling and focus on more important tasks. Whether you’re dragging an employee onto a shift or moving a shift to a new date, everything in Humanity is visual and interactive, which means you’ll spend less time managing the schedule and more time on your business. Eliminate schedule-related attendance excuses. 24/7 access to schedules and shift changes combined with SMS and email reminders give employees less chance to misread or forget shifts. PCMag: "Humanity is the future of shift scheduling software"
Whether you run a restaurant, retail shop, healthcare service, nonprofit, call center, or any other business that relies heavily on hourly staff, Humanity can be customized to suit your needs. From mom-and-pop shops to Fortune 500 enterprises, our employee scheduling software is customizable to fit your business size. Our employee scheduling software can integrate seamlessly with many of your favorite business applications, and our list of integration partners is constantly growing. Humanity. Next Generation Online Employee Scheduling Software. Start your fully functional free trial now.